Amsellem mustered a lovely voice of considerable agility with a lot of security and accuracy above the staff. She’s an effective actress…The mad scene would tax any soprano, but Amsellem dealt well with both the vocal and the dramatic challenges. 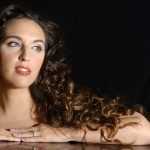 French soprano Norah Amsellem has been engaged by leading opera companies around the world including the Vienna State Opera, Royal Opera House Covent Garden, The Metropolitan Opera, Opéra National de Paris and Teatro alla Scala and has been praised for her dramatic intensity and soaring vocal technique. She is an accomplished concert artist, including collaborations with renowned conductors including James Levine, Riccardo Muti, Daniele Gatti, Seiji Ozawa, Zubin Mehta, Daniel Barenboim and George Prêtre. In recent seasons Ms. Amsellem sang Liù in Turandot and Violetta in La traviata with Cincinnati Opera and debuted at Teatro Nacional de São Carlos in Lisbon as Nedda in Leoncavallo’s Pagliacci. She also returned to the Deutsche Oper Berlin to sing Micaëla in Bizet´s Carmen and Mimi in Puccini´s La bohème. In the 2014-15 season she sang all four heroines in Les contes d’Hoffmann in Versailles, roles she then repeated with Opéra-Théâtre de Metz in 2017. She could also be heard in a concert programme under the baton of David Robertson with the Concertgebouw Orchestra and as Marguerite in Gounod’s Faust at Las Palmas Opera. She started the 2013-14 season performing at Opéra de Monte Carlo singing the title role of Menotti’s Amelia al ballo. On the New Year’s Eve Gala of the Warsaw Philharmonic Orchestra she sang Violetta in La Traviata and then returned to the United States for two guest engagements at New Orleans Opera and Seattle Opera. In New Orleans she could be seen as Mimi in La Bohème, directly followed by her engagement in Seattle, singing the roles of Olympia/Antonia/Giuletta/Stella in Les contes d’Hoffmann. She also sang Violetta in La Traviata in Mallorca, Spain. Further performances included Micaëla in Carmen with Seattle Opera, a role she has performed at Covent Garden and in her debuts at Opéra National de Paris and The Metropolitan Opera with Placido Domingo and Maestro James Levine. Ms. Amsellem was also heard at Teatro Regio di Torino as Musetta in La bohème,which she has also performed with San Francisco Opera. Further performances included Violetta in La traviata in Bari and Genoa, Italy and a return to the Vienna State Opera in the title role of Manon alongside Rolando Villazon. In the 2009-10 season, Ms. Amsellem was heard in performances of Tytania in A Midsummer Night’s Dream in Bari and Reggio Emilia, as well as performances of Gilda in Rigoletto in Palermo and Wiesbaden, Germany. Later in the season, she was heard as Violetta with Deutsche Oper Berlin, made her debut in Seville, Spain as Liù in Turandot, and was heard as Donna Anna in Don Giovanni at the Teatro Colon in Buenos Aires, Argentina. Ms. Amsellem’s operatic repertoire includes a core of leading roles that she has made entirely her own. Prominent among these is Violetta,which she has sung at the Vienna State Opera, the Bavarian State Opera, Madrid’s Teatro Real, Barcelona’s Gran Teatre del Liceu, Deutsche Oper Berlin, Covent Garden, Teatro Municipal de Santiago and Bologna’s Teatro Comunale. She has also distinguished herself as Liù, which she has sung at the Metropolitan Opera, San Francisco Opera, Teatro di San Carlo, and with the Teatro del Maggio Musicale under Zubin Mehta, both in Florence and on tour in Japan. Other roles with which she has been firmly identified are Leïla in Les pêcheurs de perles, which she sang with San Francisco Opera and Washington National Opera, and Gilda in Rigoletto, which she sang at the Metropolitan Opera, the Bavarian State Opera, as well as in Avignon and Toulouse. Other highlights of Ms. Amsellem’s career include Mimì in La bohème with Teatro Real, Maggio Musicale di Firenze, Palm Beach Opera, and in concert with the Atlanta Symphony, which was recorded for the Telarc label. Additional roles include the Countess in Le nozze di Figaro with Opera Colorado and at the Glyndebourne Festival, Elvira in I puritani for Seattle Opera and both Norina in Don Pasquale and the title role in Roméo et Juliette in Bordeaux. As a concert artist, Ms. Amsellem has sung Fauré’s Requiem under Georges Prêtre at the Musikverein in Vienna; Orff’s Carmina Burana with the Boston Symphony Orchestra, Beethoven’s Symphony No. 9 with Leonard Slatkin and Seiji Ozawa; and Mahler’s Symphony No. 4 in Lyon and with l’Orchestre National de France, among many others. She was heard with the Orquestra Sinfónica de Barcelona in Ravel’s Shéhérezade and as Mathilde in Guillaume Tell with Rome’s Accademia Nazionale di Santa Cecilia under Antonio Pappano. Early in her career, Ms. Amsellem was the recipient of several international prizes and was a member of the prestigious Metropolitan Opera Lindemann Young Artist Development Program. Her EMI recording of Ravel’s Les Cantates de Rome under Michel Plasson was awarded the Prize of the Académie Charles Crosand in 2004, Claves Records released Ms. Amsellem’s solo recording of Mélodies Françaises with pianist Dalton Baldwin. She has also recorded a disc of Verdi Songs with pianist Lydia Jardon, which was released on the Ar Re-Se label. Amsellem has the more frail physique and a deeper understanding of the role – some heart stopping soft singing and the most upsetting death scene of any Violetta I have seen in this production.